I’m teaching Beginning Bargello at my local guild for our June workshop. If you are attending the workshop, here are some photos to go with the beginning instructions you were given when you signed up. I would suggest that you NOT use fabrics with a large print in them. We will be cutting small slices from some of them and you could end up cutting a totally different color than you are expecting to appear from a large print. After choosing your fabrics and pressing them with starch, cut SIX 2 1/2″ strips from EACH fabric. Lay them out in the order you want to sew them. Make sure the top one plays well with the bottom one, too. Cut the last 2 sets in half at about 20″ wide. 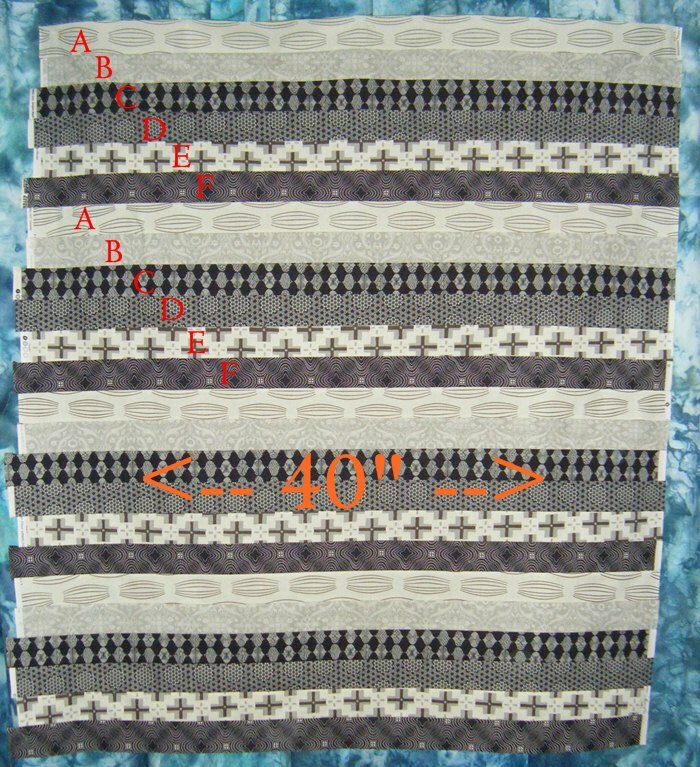 Sew those 4 units together to have a 1/2 strip but it is like the previous with 4 sets. You’ll now have 1 1/2 strip sets. This is what you bring to the workshop. Do not trim the ends, we’ll do that when we are ready to cut but no need for those edges to wiggle in transport. Here are some photos of a bright version of Bargello that I made. okay, yes, the pictures and further comments here clears up any confusion (though I think that is just me, not your instructions). And I *love* the black and white version!!! I think that will be awesome!! !